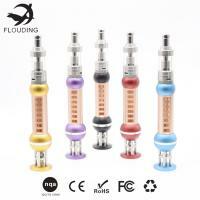 Home Companies Shenzhen Flouding Electronic Cigarette Co., Ltd.
a. Exclusive hollowing technology makes the main body more delicate and much easier to dissipate heat. b. Appearance of this e cigarette is the same with the real Oriental Pearl which is a landmark in Shanghai. c. Oxidating on the surface of the main body of this e cigarette enables it to present different colors, which offers you more choices. d. The battery locking device has already been settled to the end of the main body of the e cigarette, which brings you much convenience in case you have pressed the power button accidentally for a long time and make the atomizer be damaged. a. Contain no tar, NO2, acrolein, CO, hydrocyanic acid, As, Hg and other hazardous chemical substances. a. In non-smoking areas as train station, airport, hospital, theater, library, etc. b. In fire-proofing or fire-banning areas as gas station, forest, etc. c. On easily-catch-fire places as bed, blanket, carpet, etc. 6. having been authorized all kinds of certificates like RoHS, CE, FC, etc. Q1: Will the atomizer leak oil? A1: No. Oil leak mainly takes place on O-rings. These O-rings in our company have all received the tensile test before being assembled to atomizer. Moreover, although newly-produced O-rings are unable to work long, we can prolong their service time with our exclusive method. Q2: Will the atomizer have a tube burst? A2: The probability of tube burst is under 0.2%. We cannot assure you there is no tube burst at all, because tube burst is connected with the size of hardware and the size and quality of tube. However, you do not need to worry at all. The glass tube we have adopted is in high heat-resistance and high toughness, and is crack-free when being assembled. When it is done, we will inspect it all over again. Until now from our hundreds of thousands of sale records, we never receive a feedback about tube burst. Q3: Do you offer after-sale service? A3: We promise that we will offer free refund service if the product after arrival within 7 days has any quality problems and free maintenance service if within 3 months.